When you start learning about Microprocessors (in most case you will begin with Intel 8085) and Microcontrollers (usually you will begin with Intel 8051 from the MCS 51 micro controller family), the first question that pops up is “hey… what’s the difference in between” ? In this article I am explaining the basic differences and similarities between a microprocessor and micro controller. In fact you can call this article a simple comparison of both micro computing devices. This comparison will be same (at the basic level) for any micro processor and controller. Â So lets begin. At the basic level, a microprocessor and micro controller exist for performing some operations – they are – fetching instructions from the memory and executing these instruction (arithmetic or logic operations) and the result of these executions are used to serve to output devices. Are you clear? Both devices are capable ofÂ continuouslyÂ fetching instructions from memory and keep on executing these instructions as long as the power is not turned off. Instructions are Â electronic instructions represented by a group of bits. These instructions are always fetched from their storage area, which is named as memory. 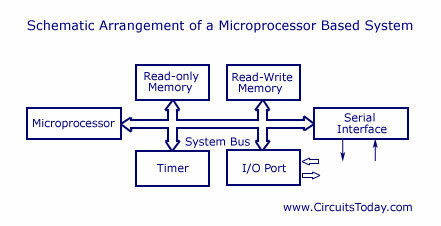 Â Now lets take a closer look at block diagrams of a microprocessor based system and a micro controller based system. Take a closer look at the block diagram and you will see a micro processor has many support devices like Read only memory, Read-Write memory, Serial interface, Timer, Input/Output ports etc. All these support devices are interfaced to microprocessor via a system bus. So one point is clear now, all support devices in aÂ microprocessorÂ based system are external. Â The system bus is composed of an address bus, data bus and control bus. Okay, now lets take a look at the microcontroller. 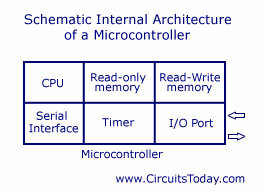 The above block diagram shows a micro controller system in general. What’s the primary difference you see? All the support devices like Read only memory, Read – Write memory, Timer, Serial interface, I/O ports are internal. There is no need of interfacing theseÂ supportÂ devices and this saves a lot of time for the individual who creates the system. You got the basic understanding ? A micro controller is nothing but a microprocessor system with all support devices integrated inside a single chip. There is no need of any external interfacing in a micro controller unless you desire to create something beyond the limit, like interfacing an external memory or DAC/ADC unit etc. To make this microcontroller function, you need to give a DC power supply, a reset circuit and a quartz crystal (system clock) from external source. Okay, so we have an idea about the basic difference between a microprocessor and microcontroller. Now lets compare some features of both systems. As you already know, support devices are external in a microprocessor based system where as support devices are internal for a micro controller. Micro controllers offer software protection where as micro processor base system fails to offer a protection system. This is made possible in microcontrollers by locking the on-chip program memory which makes it impossible to read using an external circuit. Okay! So that are basic differences, now you can come up with some more. As we need to interface support devices externally in a microprocessor based system, time required to build the circuit will be more, the size will be more and power consumption will be more in a microprocessor based system compared to microcontroller. Very helpful , logical and easy to understand. Thank u a lot.it helps me a lot.as a rural backgrund. well,this article is really helpful. thank you for sharing. Sir,what is on chip program memory and serial interface? Can u explain in detail…. It is a good theory with proper explanation. electronic circuits and components too. what is the difference between microprocessor and microcontroller based on software? @Tuhin – They both differ mainly on hardware. I think there’s not much of a difference in the way “software” is handled for both! dear sir, could you pls suggest some ideas on embedded system project.. pls reply soon..
i want even a deep explanation…………. sir, i am having a project on implementation of modifying single phase preventer with meu-p 8051 micro controller.sir can you please help me with the circuit diagram and programming for 8051.please help me as soon as possible. Sir,I am having a project on interfacing a temperature sensor with mue-p 8085 if able also with mue-c 8051,along with two seven segment displays,which will sense the temperature and display it on the seven segment display.Sir,can you please help me with the pcb design circuitary and programming for both?Sir,Please help me as soon as possible. Hello shweta, please wait one or two weeks, we will come up with articles on 8051 interfacing very soon. We are working to develop complete tutorial for 8051. Sir,please publish an article on microcontroller programming.For this I am searching in many websites but not clear. I want to program a chip through my laptop(windows7).What are the hardwares,softwares,cables & ports required to program a microcontroller? Sir, Please tell me what is the major difference between the ICs of the CD 4011B and GD 4011B. Dear Sir, I am seeing your mails everyday. It is very useful to me. I am watching your topics everyone in your website at free of cost. Thanking many more.